To sell vehicles in the state of Kansas, you will need to apply at the Kansas Department of Revenue to get licensed. The licensing process involves various requirements which you must meet, such as to be compliant with regards to your business location, to provide credit references, as well as to submit a Kansas auto dealer bond. 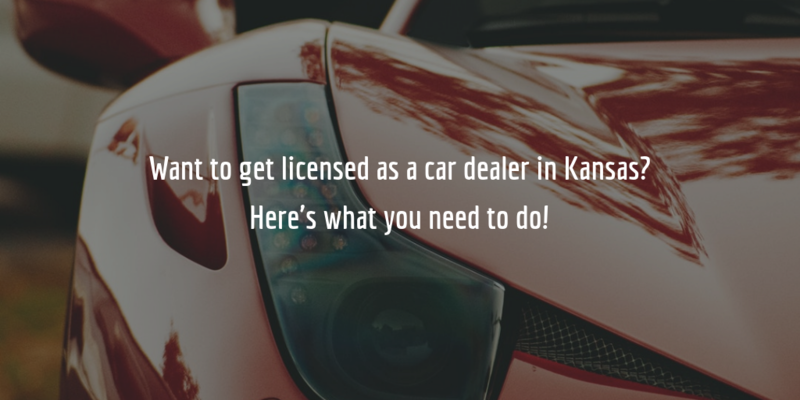 Want to get a Kansas dealer license? Read on for a full overview of the process! Selling 5 or more vehicles a year in the state of Kansas without a valid license is illegal. You must, therefore, apply to obtain one of the following dealer licenses from the state Department of Revenue. The application process for either of these license types is more or less the same with the exception of certain documents or requirements which may be required of some but not all applicants. You will then need to wait up to 30 days for your application to be processed and approved, after which your Kansas dealer license will be issued. Licenses expire yearly on December 31 and must be renewed before that date. If a license is not renewed in time, it expires and the dealer must go through the initial application process again! If you need more information about the application process or details related to being a licensed dealer, see the Dealer License and Salesperson Handbook provided by the Department. The surety bond required of Kansas auto dealers serves as a guarantee that they will comply with the provisions of the Kansas Statutes Annotated, Chapter 8, Article 24 in the manufacture, sale, distribution, and disposal of vehicles. If a dealer violates these provisions by, for example, defrauding their customers, a claim can be filed against the bond by those customers to request compensation. This compensation is extended by the surety but must ultimately be repaid to the surety by the bonded dealer! The cost of getting bonded is determined largely by an applicant’s credit score though sureties also take into account other factors. Applicants who have a high credit score, one of 700 FICO or above, can get their bond at a rate between .75%-1.5% of the total bond amount. Applicants with lower scores will get somewhat higher rates. Submit our bond application form to find out how much exactly it will cost you to get bonded! We will provide you with a free and exact quote, as well as with further details about the bonding process!